1. What Operating Systems will it work on? 2. Will it auto update on me? Sort of. There will be one version of it for everyone. The only difference that users will see right now is that if a user is a Premium Member on our sites, then whenever they are on one of our tabs (more about those down further) they won’t see ads on the updater. If they aren’t a Premium Member on our sites, there will be one 300x250 ad block in the lower right corner that they will see. 4. This means it isn’t “crippled” in any way? That is correct. There will be an “Update all” button that will work for everyone, whether you are a Premium Member on our sites or not. There won’t be any throttling of download speed if you aren't a Premium Member. The only difference right now will be whether or not there are ads showing when on our tabs. 5. Will it datamine the way some other clients do? No, it will not datamine on its own. Please note, however, that other sites (like Wowhead, Zam, etc.) may choose to write modules for it that you will have the option of installing so you can upload your data to them using the same program. 6. Modules? What do you mean, modules? The way it is being written, anyone who wants to write a module for it to allow it to add functionality for their site will be able to do so. This means that there could be a module for it to work for Curse. Or one for wowui.incgamers. Or Wowhead, or Zam, or …. 7. But, isn’t that what you guys were complaining about with WowMatrix in the first place? That they were downloading from your site without your permission? b) they will be able to show their own ads & respect their Premium/Non-Premium membership restrictions, etc when a user is on their tab. 8. Don't I have to worry about modules being keyloggers? Any time this changes, you will be notified and must approve it. This way, you always know the limits on what the module will do. If the module ever tries to do something it's not allowed to do, it will be blocked forcibly. 9. Can we get a look at the API we’ll need to use to write these modules? Yup, Shirik has posted the alpha version of the API here. 10. Will there be a way to ignore a mod? 11. What about getting more info on a mod, like the change log or description? This will be another option on the right-click menu. 12. And author donation requests? Any author who has donation requests enabled on the site will also have those donation requests showing on the updater. 13. Will the beta test for it be public? Yes, the beta test will be public. 14. How long until it is ready for beta testing? Why isn’t it ready now? We can’t give you an answer on when it will be ready. We hope it will be ready soon, but the answer to the second half of the question is why we can’t give you a definitive answer to the first part. To answer the second part, the reason it isn’t ready yet is because we have one person, Shirik, coding it. He is doing this voluntarily as his schedule allows. He is a Grad Student in University, has to worry about securing work that pays (yes, that nasty money stuff ) so he can afford to live, worry about securing an internship for over the summer, etc. While our updater is important to us, the “real life” of our staff, their health and well being, is more important to us. He’s getting it done as quickly as he can, and we aren’t putting pressure on him to try to get it done faster. We’d by far rather that he does well in University, earns money so he can afford to live, actually gets some sleep once in a while, etc., than that he work himself sick and let those things suffer in order to get the updater done faster. So, it isn’t ready yet and we can’t give you any specific date that it will be ready. We hope it will be soon. He does too. But … it’ll be ready when it’s ready. 15. Then why did you block WowMatrix when you didn’t have a viable alternative? Simply put, we didn’t have an alternative. (This is NOT to lay blame on them, so please don’t go taking it out of context.) Curse was in a position where they were ready to block WowMatrix. They were going to be going ahead whether we did or not. If we didn’t do it at the same time, our site would have simply been crushed under the load, since it would have all fallen on us instead of being split between the two sites the way it was before. So we had two choices. We could block them, even though our updater isn’t ready, and still have our site be usable to anyone that wanted to come to the site; or we could not block them and just have our site be down completely, thereby making it so that no one could get to our site at all. We could wish our updater had been ready, so that we had a viable alternative to offer you, but see #14. 16. Well what the heck am I supposed to do in the meantime? Hopefully that’ll help some in the meantime. 17. What does it look like so far? 18. Will I be able to search your site and install addons directly from the program? Yes you will. You can see in the screenshots that there is a search box. You will be able to put terms in there and another box will pop up with suggested addons based on the terms you used and will show you the authors' descriptions of them. (You can see it in the screenshots). For extended, sometimes technical, details for some of what I’ve posted above, I’m copying over responses from some of our other threads/posts. • OSGi Interface - The MMOUI Manager now interacts with a framework known as OSGi. This allows ANYONE to write modules for the application so that it can connect to other sites, add in new unpacking utilities (such as if someone wanted to write something to unpack 7zip, for example), etc. The possibilities are endless. 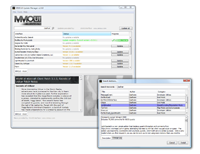 • Multi-Game Tracking - As a side effect of being able to link any site to the MMOUI Manager, the MMOUI Manager is now capable of tracking and updating multiple games in a single pass. • News Features - A panel is added which allows for the display of news information (such as what you are reading now). 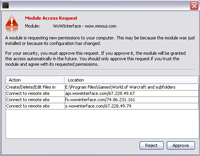 This interfaces with OSGi so that anyone can link the MMOUI Manager to any site. • Improved Addon Heuristics - The MMOUI Manager has advanced heuristics now in place which automatically detects the ID of any addon to update. This eliminates the need for users to manually type in the ID of any addon not in their favorites list (which was required previously). It also eliminates the need to log in to access your favorites list. This is not an all-inclusive list and just was what I can think of right now off the top of my head, but I hope it lets you get an idea of what to expect in the new version. We have alpha testers from Windows, Mac OS, and Linux all reviewing the software right now. Additionally, there will only be a single release for all three OSes, as an OS-independent installer application, which will identify OS, architecture, and JVM version to obtain the correct release for you, painlessly. There is going to be a Mac version of the UI manager right? 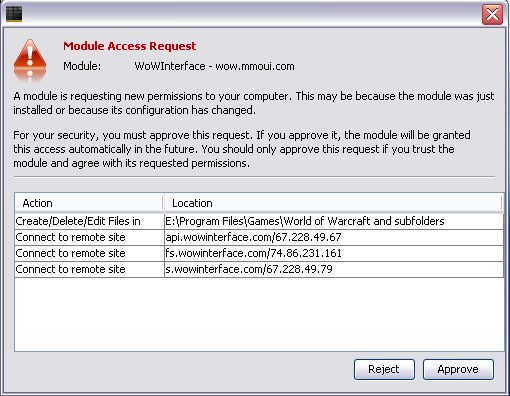 I mean surely if WoWMatrix pulled off both a PC and a Mac version, WoWInterface will have one right? the client as stated in the thread is going to be platform independent. so yes it will work on a mac/linux/windows environ... it will be one program that works on all three platforms. Just to clarify, actually several different applications will be maintained because of one of the components being OS-specific and architecture-specific, however to the user this will be transparent -- the installer and updater will figure out which OS/architecture combination will be appropriate and install it accordingly. To the user, there is only one program. However the fact that there are actually multiple ones, bugs might pop up only for one OS or architecture (this has already happened once). How are you doing the update. The old one already has updates for the addons. Can't you treat the update like an addon and make the program restart so that updates take effect? It would be next to impossible to meaningfully treat it as another addon. The biggest problem with having it update itself is the fact that you cannot replace files that are currently in use (namely, the executable file). As a result, there is a "Module Center" where all updates of the core and modules are handled. When an update is available, two things can happen. If it's a required update (this will only be done in the event that everything will break if you don't install it), then the module center will pop up on startup and require you to install the update to continue (you can cancel, but the program will shut down). If the update is not required, you will just see a red message, out of the way in a corner, indicating that there is an update available and to go to the module center to apply the update. The modules are updated while the program is running. This goes into OSGi details that are probably too technical for this forum, but suffice to say the module is shut down, replaced, and restarted. The program does not have to restart. When the core needs an update, the program first downloads an update "bootstrap." It then executes this program in another process and shuts down. The bootstrap program then downloads the full update (specifically, the files to replace), waits to ensure that the program has shut down, and then replaces the files. Finally, it restarts the application. This is similar to how WoW is updated. The forum is open for questions, suggestions, feedback, whatever. Have at it guys. Last edited by Cairenn : 04-24-09 at 12:51 AM.